Design and deploy AAA-quality characters on an indie budget. Includes tools for character creation, animation, face/body motion capture, and a massive motion library catering to game development. Optimize game characters with polygon reduction, LOD, UV and material merging for max efficiency. Import ready-to-play characters into game engines with Character Creator’s automated support for shader assignment, game controller and facial performances. 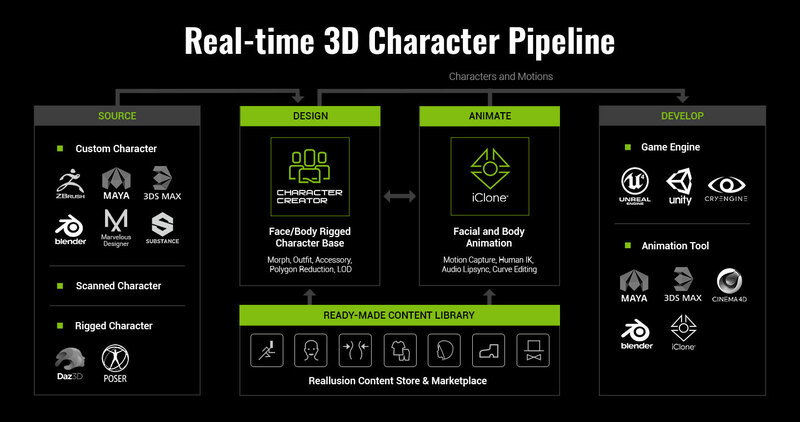 CC 3 offers fully-rigged characters ready for animation and mocap, and optimized character base for real-time game performance along with infinite combinations of 3D morphing possibilities. Compatible with Daz Studio / Poser content, and streamlined with 3D tools like Substance Designer, Marvelous Designer for custom outfit design. Gamify with mesh optimization technology and fast export to game engines with custom profile, and auto-setup script. Dedicated FBX export profile compatible with Unity. Automated skeleton mapping for Unity Humanoid characters. Auto-create Unity Animator for mecanim controls. Export motion sequences and assign Animator Controller. Auto-assign loop animations when source clips includes "loop" keyword. Create character Prefab for character reuse and instancing. Auto-assign character LOD from multiple FBX meshes. Dedicated FBX export profile compatible with Unreal. Automated skeleton mapping and bone naming for UE4 characters. Auto-assign character LOD from multiple FBX character meshes using the same skeleton. Auto-assign loop animations when source clips includes the "loop" keyword. Editor Script to auto-convert imported FBX files. sRGB Correction for Metallic, Roughness, AO for correct display in Unity. Standard PBR - Unity Built-in Shaders. HDRP (High Definition Render Pipeline) - high realism for console or advanced graphics environment. LWRP (Lightweight Render Pipeline) - optimized performance for mobile and low-end hardware. Pack ORM (Occlusion Roughness Metallic) texture from corresponding CC texture sources. Unreal Photorealistic Character Shader (LW) based on Unreal's Samples and Tutorials here. Advanced Unreal Digital Humans (HQ) - the ultra-realistic shader based on Unreal's samples and tutorials here. Polygon reduction for select items and wearable assets. Bake dense mesh detail to diffuse and normal map to enhance low-poly display. Merge texture UVs in order to reduce draw call in game engines. Generate character LODs for optimal game performance. Convert to low-poly CC Game-Base character while keeping facial animations. Body animation with unique puppeteering engine, motion clip blending, HIK timeline motion layer editing. Facial animation with audio lip-sync and puppet emotive expressions with motion key editing. Dynamic soft-cloth and hair physics behaviors. Motion curve editing over animation time and spacial adjustments. Use iClone Motion LIVE for full body motion capture. Accurate facial capture using Faceware/iPhone X. 60 facial morphs supports blending. Compatible with all major body mocap device including OptiTrack, XSens, Noitom, and more. Hand tracking using ManusVR/Leap Motion. Stream motions directly from iClone to Unreal and skip FBX motion file export and import. Once the characters and animations are created, the task still remains for developers to put together the assets in a game engine. They may find themselves hampered dealing with complicated import and setup routines that may take hours to apply. 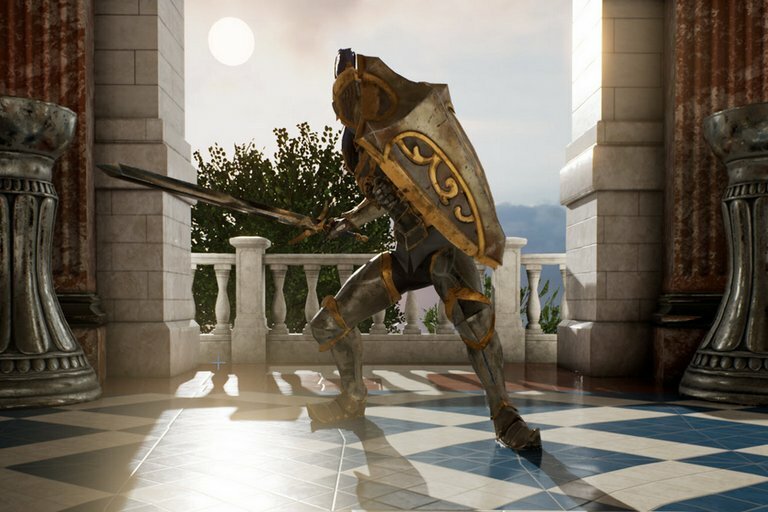 Reallusion offer tools to automate the process of digital human shader assignments and characterization for Unreal Engine 4 and Unity Mecanim. Now your characters are ready to play in no time at all! Get the Unity Editor Script file to convert CC characters for Unity Mecanim. Includes shader options respectively designed for Unity Built-In shader, HDRP and LWRP. Get the Unreal Plugin to convert CC characters for Unreal Engine 4 with shader options designed for Photorealistic Characters (LW) and Advanced Digital Humans (HQ).